This might be my last revision post for my BBKA Module 6 Honeybee Behaviour exam on Saturday! And I’ve only got half way through the syllabus. It is the oldest female workers in the hive, aged between 3-6 weeks of age, which forage for the colony. They literally work themselves to death doing so. The lifespan of a worker bee is dependent not so much on chronological age as the amount of work she does. Workers have glycogen reserves in their flight muscles which last for approximately 800km of flight; after these are exhausted the bee is unable to create more and will collapse and die. During the foraging seasons around 25-30% of the colony’s population is potentially a forager bee, depending on the availability of flowers and the needs of the colony. Once bees are old enough to forage they will remain doing this task for seven to eight days on average before they die. So the bees you see returning to the hive laden with pollen are likely to be reaching the end of their days. 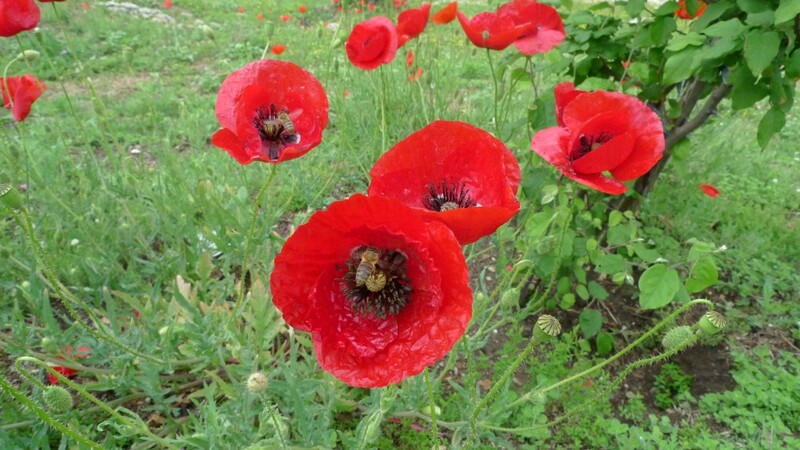 Albanian honey bees on poppies. 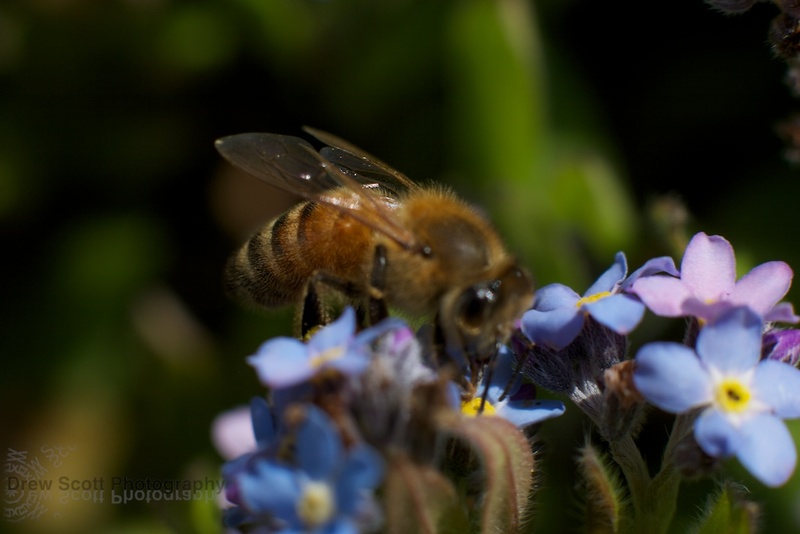 What do honey bees forage for? They leave their home to collect four essential products: pollen, nectar, water and propolis. What they collect is dependent on time of year and temperature, for example nectar is generally collected at minimum temperatures of 12-14°C or above and propolis is too hard to collect at under 5°C. A study by Ribbands (1949) found that around 58% of bees collect nectar only, 25% pollen only and 17% both nectar and pollen. Honey bees generally forage within a 1km radius from the hive, but in extreme cases go up to 13km for particularly rewarding sources. A study has found that they forage for nectar up to 13km, for pollen up to 6km and for water up to 2-3km (‘The Foraging Honey Bee’, JJM van der Steen, BBKA News February 2015). Pollen is a lighter load, but nectar gives them a higher energy return relative to effort (8:1 gain pollen, 10:1 gain nectar if a 40% sugar nectar). Foraging trips usually take ten minutes for nectar and thirty to eighty minutes for pollen – perhaps pollen is more time consuming to collect because it needs to be brushed and packed into the bees’ pollen baskets. How much do they collect? On average loads of 30-50mg of nectar, 16mg (8mg x 2 pollen baskets) or 25mg of water are collected – impressive considering a honey bee only weighs about 100mg. The amount collected depends on the distance flown to find the nectar source and on the nectar sugar concentration, with bees collecting less of a nectar if it is low in sugar. Both nectar and pollen collectors need to visit anywhere from 1-500 flowers to collect a full load and will go on an average of 10-15 trips a day. It takes four pounds of nectar evaporated down to produce one pound of honey; it takes about a dozen bees to gather enough nectar to make just one teaspoon of honey, and each of those dozen bees needs to visit more than 2,600 flowers. The amount of flowers available place a limit on how much honey a colony can produce to meet its needs – no location supports an infinite amount of colonies. Annually, an average colony requires 60-80kg of honey, which requires a minimum of 125kg nectar to be collected and then evaporated down to create honey. This will take the colony around 4,000,000 foraging trips. The numbers are staggering and really make you appreciate the colossal effort the bees go to in order to produce their golden prize. Large amounts of protein in the form of pollen is required too – 15-30kg pollen annually, depending on the amount of brood in the colony. Workers watch the round, transition and waggle dances given by their fellow foragers and judge from the sugariness of nectar samples offered, the number of dancers for a particular crop and the enthusiasm of the dancers in terms of waggle intensity which flowers are best to visit. To help themselves orientate and successfully follow the dance instructions they rely on the direction of the sun, polarised light patterns if it is a cloudy day, the smell of flowers and the earth’s magnetic fields (workers have cells with iron containing granules in their abdomen). Younger bees rely more on wagtail dances to find forage, older bees tend to remember the location of flowers. New discoveries are happening all the time into the ways flowers attract bees and how bees detect the most promising flowers. 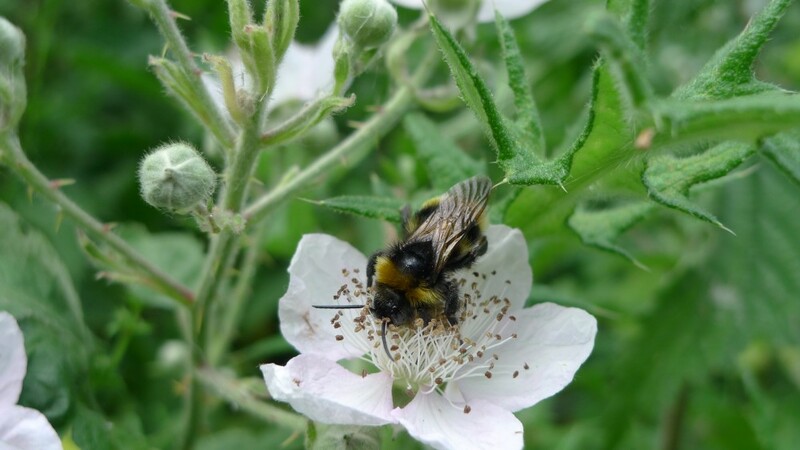 In February 2013 the journal Science published a paper on ‘Detection and Learning of Floral Electric Fields by Bumblebees‘, by Dominic Clarke, Heather Whitney, Gregory Sutton and Daniel Robert. Scientists have known for a long time that bumblebees build up a positive electrical charge as they rapidly flap their wings in flight; when they land on flowers, this charge helps pull pollen towards their hairs. Now Daniel Robert and a team at the University of Bristol have found evidence that bumble bees are aware of these electric fields and use them to guide their activities, to see if flowers have been recently plundered by other bumblebees or not. These findings may well apply to honey bees too. See the Nature.com article ‘Bumblebees sense electric fields in flowers‘ for more information on this discovery. Another major finding reported during 2013, again in Science, is that some plants, for example the coffee plant (Coffea), use caffeine to manipulate the memory of bees and tempt them back. Their nectar contains low levels of caffeine, which appears to enhance the long-term memory of bees for where those particular flowers are located. 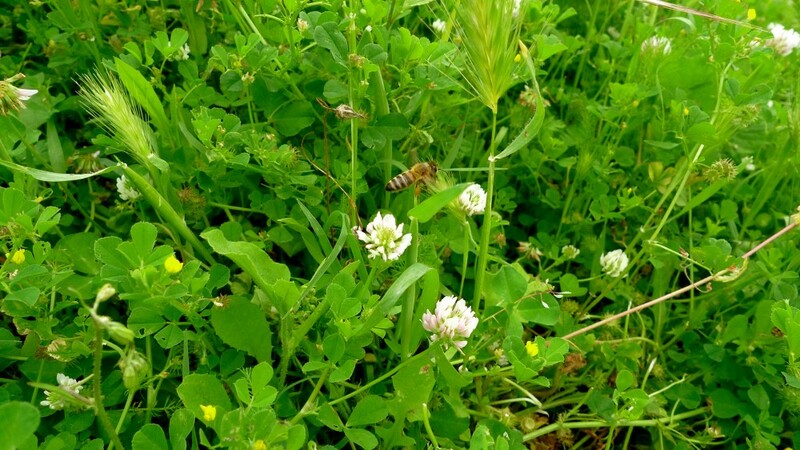 The plants benefit from repeat bee pollination by producing more fruits and seeds. Read more about this on the National Geographic website – ‘Bees Buzzing on Caffeine‘. To collect nectar bees land on the flower, insert their proboscis inside, and pump nectar up into their mouths. Sometimes the bees can cheat the flowers by gaining their nectar reward without picking up any pollen, for example bumble bees occasionally chew holes in the side of blueberry flowers to get at the nectar and honeybees take advantage of these holes afterwards. Open flowers – petals are arranged in a broad, open cup around the flower’s pollen organs. the bee bites the anthers, which produce the pollen (male reproductive cells) with her mandibles and uses her forelegs to pull the anthers towards her body. Examples of this are orchard flowers like apple, cherry, pear, plum. Tubular flowers – bees insert their proboscis into the flower’s central nectariferous areas searching for nectar; as they do this pollen gets stuck to their mouthparts and legs. Closed flowers – bees force the petals apart with their forelegs and gather pollen on their mouthparts and legs. Spike or catkin flowers – bees run along the spikes or catkins picking up pollen on their body hairs. Presentation flowers – bees press their abdomen against infloresence marks, causing a pollen mass to be pushed out of the flowers. Honey bees are particularly efficient pollinators because they tend to return to the same flowers each day as long as there is a good nectar flow. They will visit their crop of choice at the same time each day, as flowers tend to release nectar at a particular time, for example chestnut trees produce morning nectar. 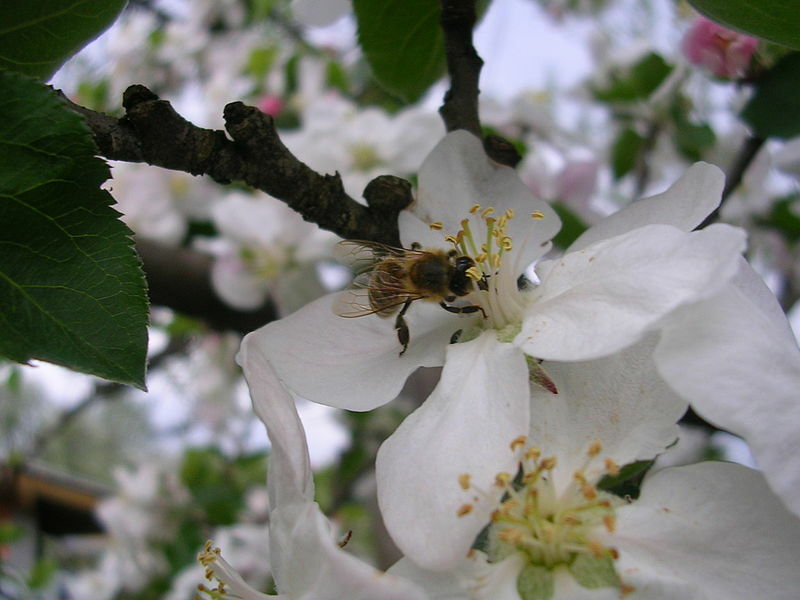 Below is a bee on an apple flower…unfortunately apple nectar is low in sugar for a spring blossom and not very attractive to bees. However, the pollen, which is a greenish to pale yellow colour, is useful. This entry was posted in Bee behaviour, Exams and tagged foraging, Module 6, pollination. Bookmark the permalink.